Orlando, FL – May 31, 2017 – MegaCon™ Orlando 2017, the Southeast’s largest fan convention, wrapped up a long weekend at the Orange County Convention Center. The four-day multi-genre convention welcomed fans to revel in panels, shopping, costume contests and more. This year’s show was packed with exciting activities for fans of all ages and featured celebrity guests including Tim Curry (Rocky Horror Picture Show), Stan Lee (Legendary Creator) who made his last Florida appearance, Ian Somerhalder (The Vampire Diaries), Richard Dean Anderson (Stargate), Famke Janssen (X-Men Film Series), Alice Cooper (Legendary Rocker), Danielle Panabaker (The Flash), James Marsters (Buffy the Vampire Slayer and Angel), Caleb McLaughlin, Gaten Matarazzo (Stranger Things), and many more. MegaCon Orlando came together with Marc Andreyko’s (DC Comics) Love is Love project to host a live art auction to honor the victims of the Pulse Nightclub massacre. The Love is Love auction raised more than $10,000 and proceeds benefited Equality Florida, Florida’s civil rights leader working for the LGBT community. Here comes the bride! Two proposals took place during MegaCon Orlando. 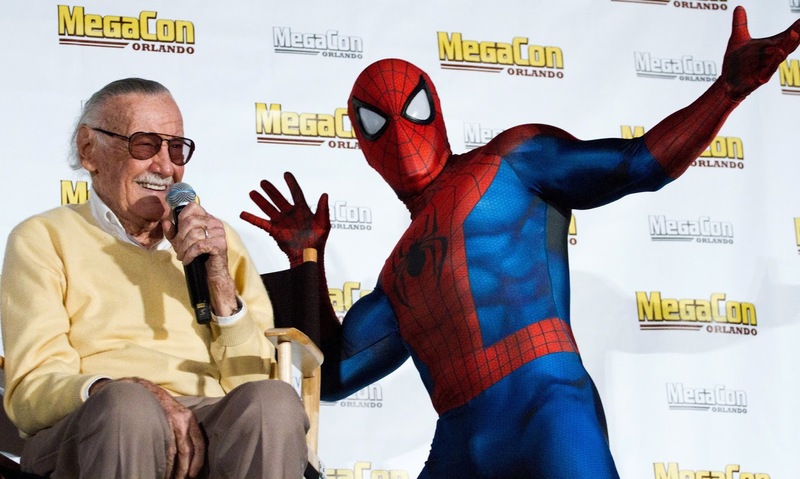 Comic Legend, Stan Lee also performed a renewal of vows for a lucky couple that celebrated their 25th marriage anniversary at MegaCon. Cosplay is always the biggest hit during MegaCon Orlando! Best in Show was won by Dovah Design as Crusader from Diablo 3! Check out the photos and other winners by clicking below. Tattoo Alley had 20 artists from The Ink-Fusion Empire lead by Marc Draven. Ink-Fusion Empire is the only professional Tattoo program that has a license agreement with Lucasfilm LTD and works side by side with the likes of Stan Lee, Dave Nestler, Arthur Suydam, James O'Barr, and countless other TV and movie celebrities. Artist alley was packed every day with eager fans waiting for their next tattoo. Fidget Spinners took the show floor by storm as this summer’s hottest toy, followed closely by the full-size body pillows featuring images from favorite anime shows. A unique Halo Drop-Pod was a popular booth, allowing attendees to go into a simulator and feel as if they were being dropped from the Earth’s atmosphere into the Orange County Convention Center. Many panels and photo opportunities took place this weekend, some including The Rocky Horror Picture Show Live Shadowcast, Q&A Session with X-Men’s Famke Jannsen, Q&A with Stan Lee during his last Florida appearance, photo opportunity with General Lee and the cast of Dukes of Hazzard, Disney Princess Voice Actor Super Panel and much more. MegaCon Orlando 2018 will take place from May 24 to May 27, 2018. Check back at www.MegaConOrlando.com for ticket sales. Can’t wait until next year?! MegaCon Tampa Bay will take place from September 29 to October 1, 2017, and tickets will be on sale starting June 15, 2017 at www.MegaConTampaBay.com.